I started doodling again for the first time in a long time. This piece is ink on paper. My good friend Marty Kenney took his own life a few weeks ago. In addition to being a kind and loving man, he was also an incredibly talented artist. (For those of you who remember the Genie Bottle, Marty did all of the designs for the laser cutwork in the wood.) I recently spent a few treasured hours looking through his sketchbooks. 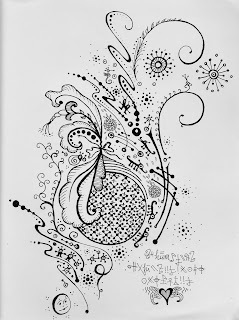 His doodles and designs filled my head to the point that I dreamt about them. When I returned home, I drew this. Some of the design elements here are definitely inspired by his, like the seahorse and the lizards, the squiggles and dots. You’ll be seeing a lot more doodles from me as I remember my friend.